Scroll down to see what other governments are saying. The European Parliament voted in September 2008 by a very large majority to recommend tighter safety standards for mobile phones and other wireless technology (including wi-fi and DECT cordless phones) particularly to protect vulnerable groups like children. It points out in particular the need to "address vulnerable groups such as pregnant women, newborn babies and children"
other types of degeneration of the nervous structures of the brain (at age 50 to 60). The Israeli Ministry of Health has recommended limiting children's use of cell phones, avoidance of cellular communication in enclosed places such as elevators and trains, and use of wired, not wireless, earpieces. The Finnish Radiation and Nuclear Safety Authority (STUK) has advised that children's mobile phone use should be restricted. 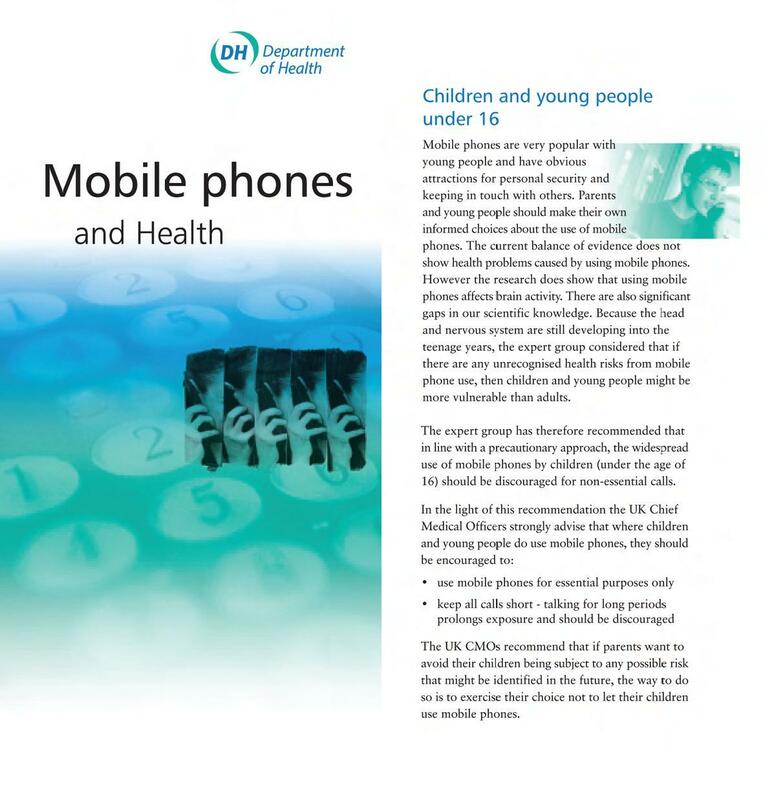 The Authority says that children will have more time to use a mobile phone for a longer period of time than adults. The long-term risks from the use of mobile phones can not be assessed before the phones have been in use for several decades. Additionally, children's brains are developing up to the age of 20 years. avoiding talking in an area with low connectivity or in a moving car or a train. "We continue to be concerned about the possible effects of Wi-Fi. Particularly on children whose brains and bodies are still developing". - appears to be concentrating on measuring radiation levels which are already known, or should have been before the technology was allowed to be used in schools." 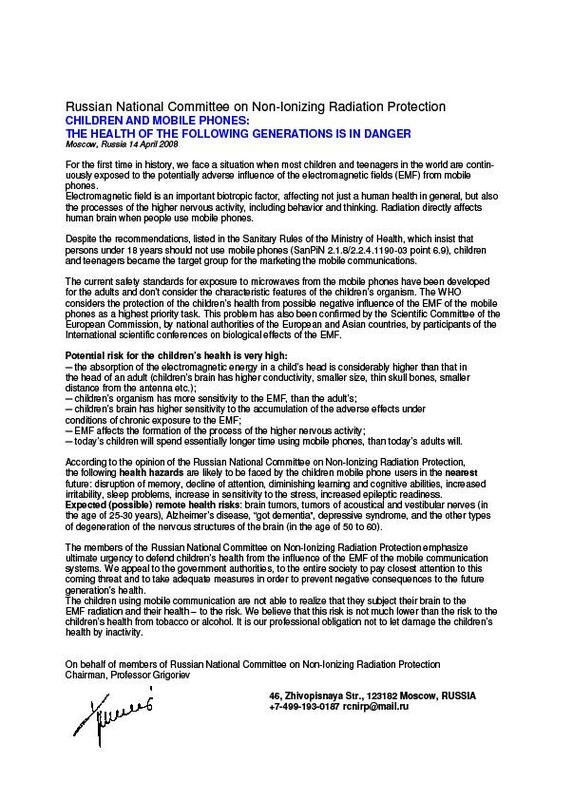 "Due to possible effects on school performance, a healthy school should not only be smoke free, but also allow teachers and students to teach and study in a radiation free environment"
The Public Health Department of Salzburg has warned that Wi-Fi should not be installed in schools or nurseries. 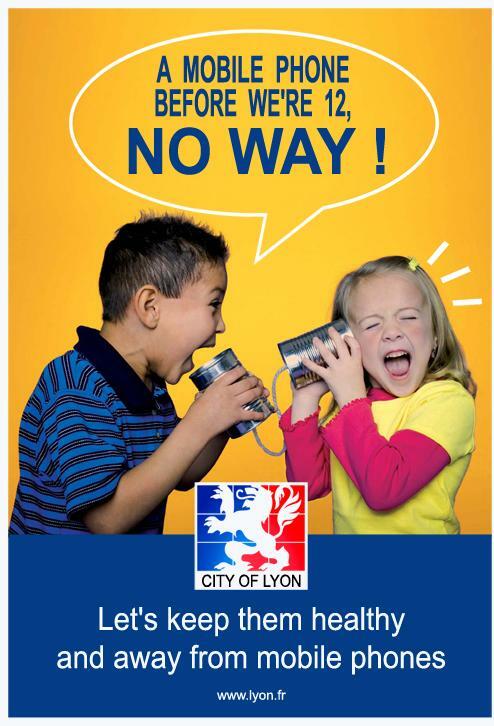 French national libraries (BNF) has imposed a moratorium on wi-fi networks in French libraries. Paris libraries have switched off wi-fi after staff reported ill effects. "that via their professional organizations, information workers address the risks of wireless technology in public spaces, take steps in learning about the risks of wireless in terms of exposure and impact on library services, monitor wireless technology in their facilities, critically evaluate and adopt alternatives to wireless technology especially in children’s sections of libraries, create warning signage on risks of wi-fi throughout their libraries,and act as a community resource in the public education on wireless technologies." Some of the information on this page was provided by www.wifiinschools.org.uk.